Announcement I know how many of you come to visit and appreciate my works. I get requests for custom pieces daily, the best ideas from my customers get made and posted here. I couldn't have done this without you. I am truly blessed by having you as my friends. I've upgraded my about page, for those who want to see the process of me making an eye frame. You can find it here on Etsy. Good news for those who have been so surprised at the priority shipping charges. I've purchased first class box mailers and will be shipping now first class mail. It was just too much to ask my Canadian and European customers to pay so much for shipping. Even with me supplimenting the charges, it just was over the top. For those who want a priority shipping box and shipping, I will be happy to send you an invoice for the extra amount. I have also found help in translating orders. I ship all over the world, and sometimes communication through email is difficult. Here's a wonderful tool, that you can choose your language and then translate it into English. I can also write in English, and have it translated into other languages. Please let me know what language you speak, and I will try to communicate to you in your language. I have been published nationally, in Step By Step Wire Jewelry Magazine, by Interweave Press. Be sure to look up the article on my Sterling Silver Woven Wire Twist Bracelet, in the December/January 2011 issue!! My work is different and one of a kind. It has beauty and strength that will be remarked upon each time it's worn. I know how many of you come to visit and appreciate my works. I get requests for custom pieces daily, the best ideas from my customers get made and posted here. I couldn't have done this without you. I am truly blessed by having you as my friends. Received my bracelet today & immediately put it on. Very nice workmanship on this piece. If you like unusual jewelry this is certainly the place to buy from. I’m very pleased with my purchase. They're gorgeous!! Thank you so so much! I can't wait to use them, photos didn't do them justice! Haystack Rock at Cannon Beach, Oregon. Our view from our room. Most jewelry makers start with raw materials, as do I. Wire in spools need to be cut and measured to appropriate length. For an eye frame, I work with 4 20 gauge wire, weaving all 4 for the first pass, turning the bottom 2. I weave the bottom 2, bend back 1, and then weave over 3, several passes to make the upper brows. 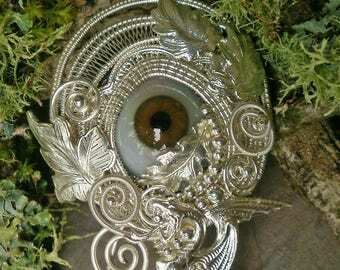 I pass the 4th wire, back to make a base for the glass eye, glueing the eye in once finished work is done. Finished frame, with an eye waiting to be set. Well, since I'm coming up on 11 years on Etsy, I thought it was time to share some of my processes. Not many of you realize I make my work, by weaving wire into frames and swirls, to hold my chosen medium. Using basic tools, and other tools that I have made, I work daily in my studio, creating works of art and whimsey. Yes, I do add pieces to embellish and florish my weavings, but each one is drilled with care, to disguise my holes. Many times I get asked how long it took to make this piece, and I will let you know I can make an eye frame in 1 1/2 hours, from cutting the wire, to listing it. I've been creating wire designs for 10 years, and self employed for five. It has given me great joy to have almost 15,000 admirers, each looking and appreciating what I've created. I hope to someday be able to teach my method to others, so that they could make their own works. Self employed artist and designer. Wire worker extraordinaire. Retired English Professor, hubby and all around good guy.